Ask Margee Halsch - Creative ART Seeds a question. They will receive an automated email and will return to answer you as soon as possible. Please Login to ask your question. I have been teaching art projects to first graders for several years. I have been teaching adult classes for over 25 years in corporations. Young students are much more fun and creative! My teaching style is a demonstrator or coach style. I like to encourage students to create art their own way. They select colors, shapes and objects to fit their artistic style. After teaching one of my art class, three students asked their parents to take them to a local painting class (outside of school). Each brought their painting to school and asked their teacher to send a photo to me. That is the reason I'm creating these art videos. This truly warms my heart. 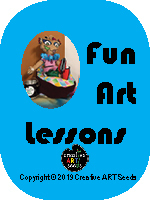 I'm excited to create a variety of art projects for young students from sculpture, painting, collage and drawing. I'm thankful my husband continues to encourage me in this new endeavor. My two rescue dogs show their support by hanging with me in my art studio.